This is my first piece to be completed in the year 2012, and, for my poor family’s sake, let’s hope it’s not the last. 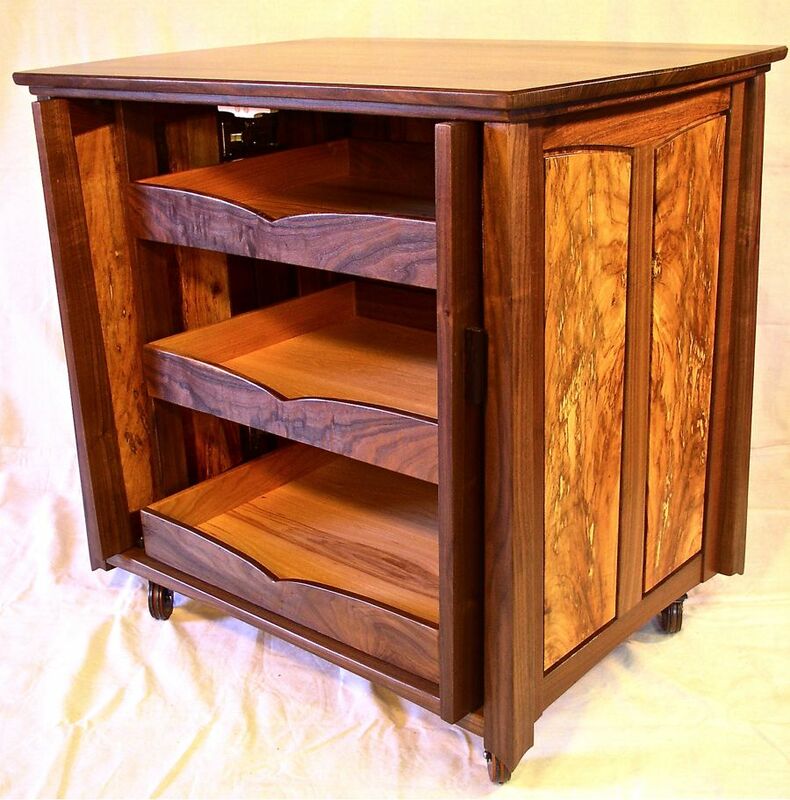 It is a companion piece to a desk and wall cabinet that I had already made for the same client, a suite of furniture all out of similar materials. 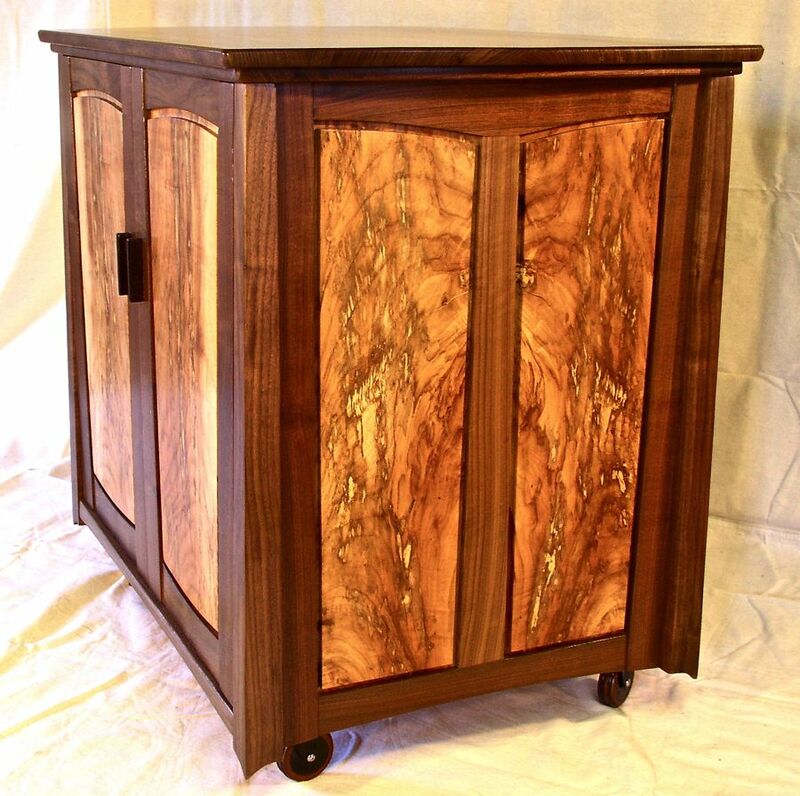 This little cabinet is solid wood throughout and made from local woods that came from trees growing in the area where I live. 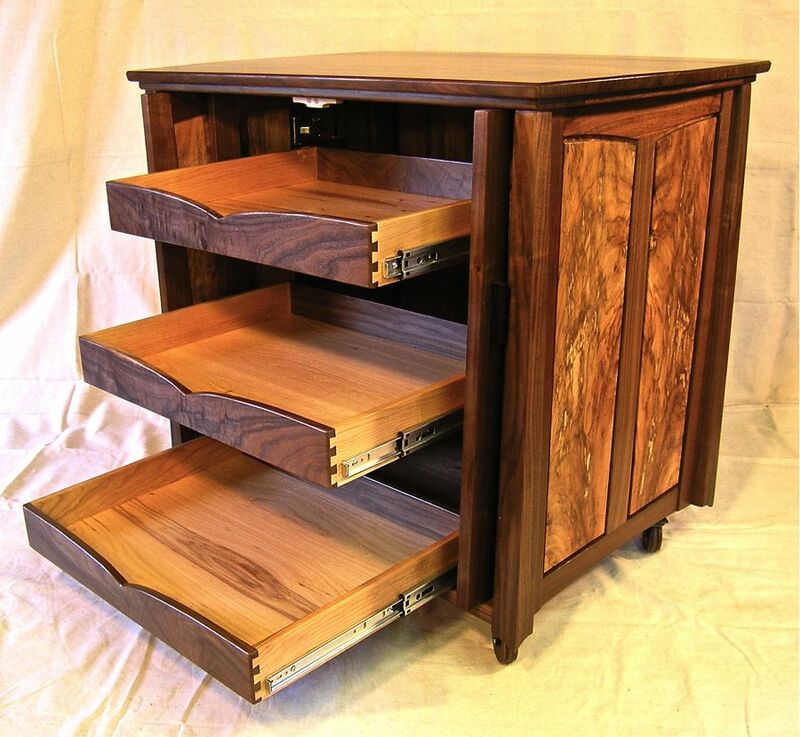 The pecan came from a dead tree that fortunately was milled into lumber before the processes of decay had rendered it completely unusable, and the walnut from a tree that was growing too close to an urban dwelling and had to be removed. 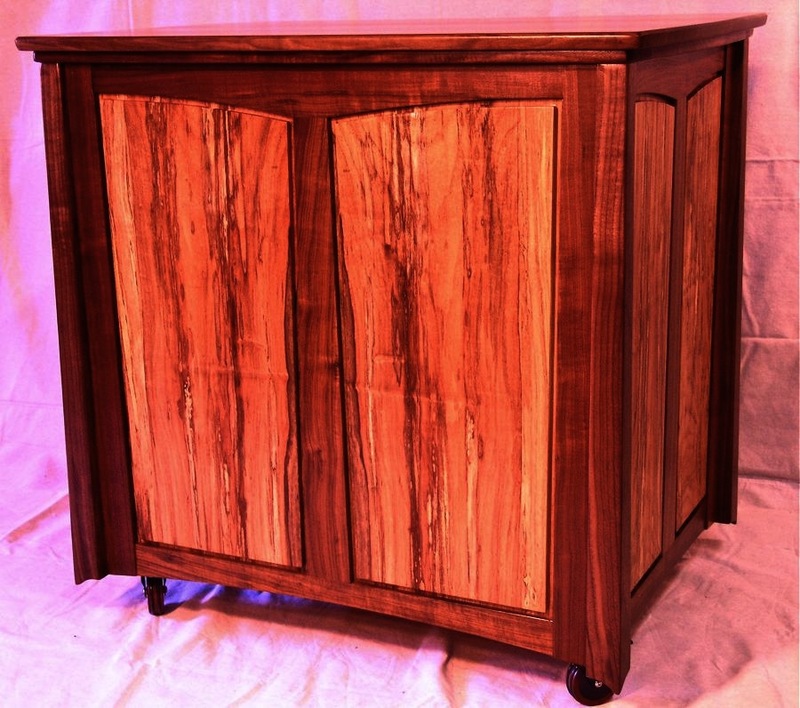 The pecan had been sawn into 2 1/2″ thick planks which I was then able to resaw and get nice, book matched panels for each side of my little credenza. The credenza is on casters so that it can be easily moved around, and because it sits out in the middle of a room most of the time, I wanted it to look good from the back as well. At my client’s request the doors retract back into the cabinet when they are open. 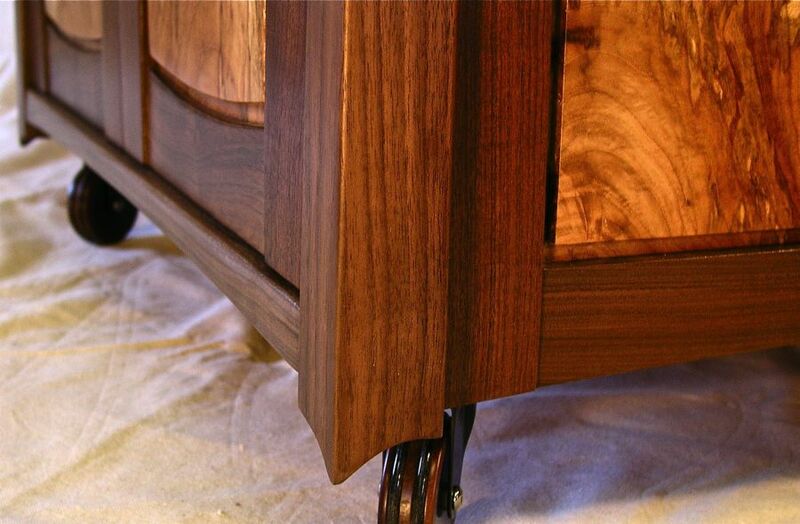 The interior drawers are mounted on full extension glides to provide easy access to the contents stored inside. 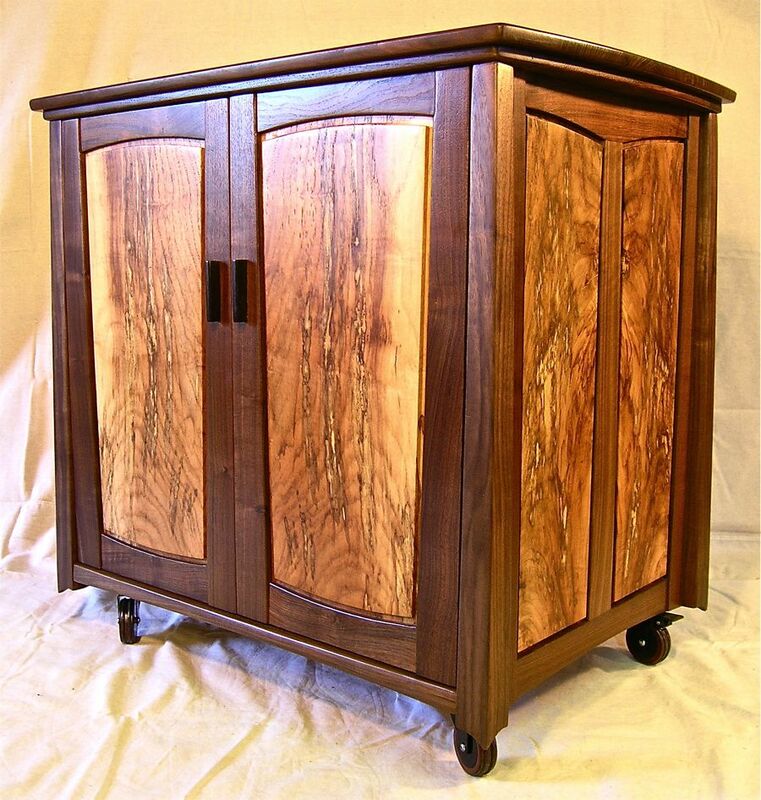 Like the rest of the material in this piece, the drawer bottoms are solid wood as well and came from an east Texas shagbark hickory tree. In the design I am playing with tapers and arches. All of the vertical lines taper slightly from bottom to top, and most of the horizontal lines have an arch or curve. I even added little arches to the bottom ends of the corner posts. Please look around on the blog to see more of my work and also visit my gallery page. Beautiful piece! You don’t make it easy on yourself with all the curves and tapers. Nice work. I hope your client was totally appreciative of it. A lot of people have no clue just how much effort goes into something like this. George, thanks so much for taking the time to comment. I appreciate the fact that you noticed the work that went into this piece. Just because a design is visually clean does not mean that it was easy to execute. All the best to you. That’s great how you have continued to use solid wood all these years. Your work is beautiful. If you ever need custom plywood, we have purchased some equipment and are going to start making custom plywood probably in about six months. The Brazos truck from Austin comes here and they could probably deliver it to you. Custom matching, species and sizes. We are two students at the HMC Rotterdam. For our English class we had to comment on a blog. We found your blog, and we liked the stuff your made. Keep up the good work. Thank you for your comment. I am happy you like my work. I wish you great success in your studies & in your life.